Nihoa is unlike any of the other Northwestern Hawaiian Islands (NWHI) with its 900 foot cliffs, basalt rock surface, and tiny beach. This small island is about 1 square km (171 acres) and is at the southeastern end of the NWHI chain. Although difficult to imagine today, this remote land of rugged cliffs and steep valleys provided a home for Hawaiians between A.D. 1000 and A.D. 1700. More than 80 cultural sites are known, including habitation terraces and bluff shelters, religious places, agricultural terraces, and burial caves. Many of the mea makamae (cultural objects) and structures associated with these wahi pana (cultural places) are similar to many found throughout the Main Hawaiian Islands. It is believed that the abundance of natural resources and at least three freshwater seeps may have supported as many as 175 people between A.D. 1000 and A.D. 1700. Nihoa was no longer occupied when Captain Douglas visited the island in 1789. Queen Ka`ahumanu visited Nihoa in 1822 and annexed it as part of Hawai'i. In 1857, King Kamehameha IV officially annexed the island as part of the Hawaiian Kingdom. In 1885, Queen Liliu`okalani and her 200-person entourage visited Nihoa and documented their trip. 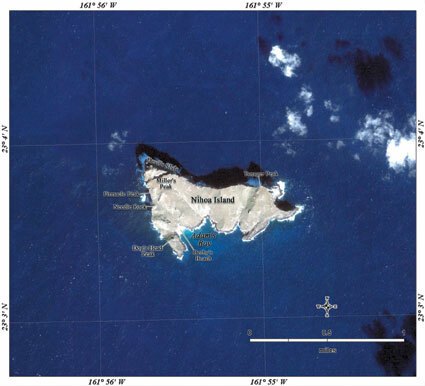 In 1909, Nihoa and the other islands, islets, and reefs of the NWHI (except Midway) were recognized by the United States as a valuable treasure to be protected in perpetuity as the Hawaiian Islands Reservation. "The Reservation" was the forerunner of one of the earliest established National Wildlife Refuges in the country. In 1923-24, the Tanager Expedition visited Nihoa to conduct cultural and biological research. In 1997, the Native Hawaiian group Hui Mälama I Nä Küpuna O Hawai`i Nei returned ancestral bones to Nihoa that have been removed from the island decades earlier. The island's rugged landscape may seem uninhabitable from a distance but the very essence of Nihoa is life, a treasure chest of species found nowhere else in the world. Niches in rocky outcroppings support some of the most unique and varied insect, seabird, and plant life of all the NWHI. Seventy-two terrestrial arthropods including giant crickets and earwigs, and two endemic landbirds, the Nihoa finch and Nihoa millerbird, are found only on Nihoa. Native endangered plants include a loulu or fan palm and 'ohai shrub. Basalt underlies most shallow water habitats surrounding Nihoa. Limu (algae), wana (sea urchin), and opihi (limpet) inhabit these shallow waters, while sharks and jacks hover in deeper waters offshore. The submerged coral reef habitat covers about 142,000 acres with seventeen species of stony corals documented. Sheer basaltic cliffs on the north side of the island continue underwater, plunging vertically to great depths. Due to strong wave action and lack of protected areas encrusting corals are the dominant coral species found here, and they exist mostly in waters deeper than forty feet. Fishes uncommon or rare in the main Hawaiian Islands but typical of the NWHI, such as spotted knifejaws (Oplegnathus punctatus), are often seen at Nihoa. In order to protect the island's fragile ecosystem, few visitors are allowed on Nihoa and strict protocols are required. Approval must be given by the U.S. Fish and Wildlife Service and is mostly granted to those doing cultural and scientific research.